Fri., Sept. 7, 2018, 2:33 a.m. In the last year, Don Grant learned more than he ever thought possible about growing cannabis – and he’s been growing it for a significant part of his life. “I’ve already tried most of the things that a lot of people are doing now, but at the same time I’m also always trying to find better ways to do this,” he said. As the head grower of The High Road, a family-owned indoor farm based in Deer Park, Grant focuses on growing about 17 strains which can be found in about 24 stores statewide. Grant spent several years working at an outdoor farm in Humboldt County, California. He later worked on the medical marijuana side for two years and studied horticulture and homeopathic medicine. The High Road opened about two years ago after the family purchased a license from an existing farm. Grant sketched out the design for an ideal facility, and helped build it, including clearing plenty of trees. Grant also enlisted the help of family members in the venture, including his mother Martha Vandouris, sister and brother-in-law Brenette and Ed Leifer, and fiancée Amber Grant. 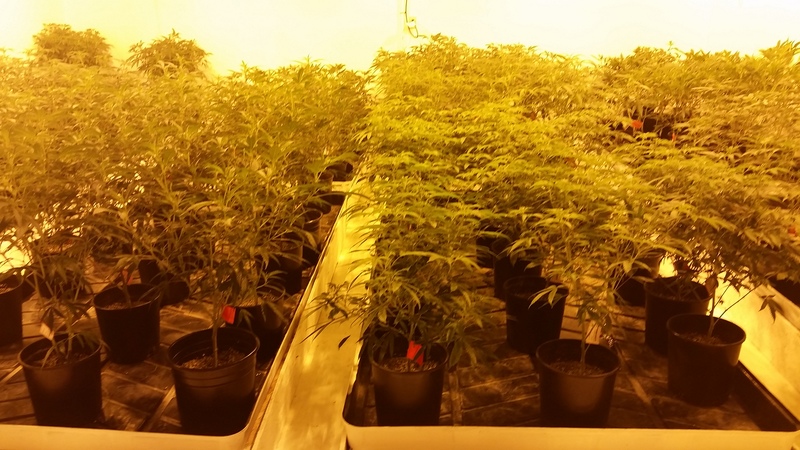 Other neighbors and family friends help in the cultivation and packaging process. Ed and Brenette also own Blades, a Spokane salon that has been around for more than 40 years. They focus on customer service and want to make sure retailers and budtenders learn everything about The High Road so they can pass their knowledge and excitement onto customers. What really makes The High Road special, however, is the plants themselves. Don focuses on growing larger plants, not necessarily smaller plants with big buds. “Instead of 500 plants that are exactly the same size, we grow 24 that can have a good yield, and work out to be 300 pounds per light,” he said. He also provides attention to the lighting, including determining the optimal spectrum, positioning, and quantity. While some indoor farms place their LED lights nearly right on top of the plants, Grant places then higher. The High Road recently invested in ceramic metal halide lights, which better simulate different intensities of sunlight at different times of the year. The multi-spectrum lighting in each room can be adjusted by smartphone from anywhere. There are also fail-safes that power the lights down if the air conditioning or de-humidifer breaks. Grant grows the plants in dirt, using synthetic fertilizer with organic properties. Plants are also hand-fed daily. He’s also is experimenting with neem, a herb found in India, that can act as a natural defense against fungus gnats. Brenette Leifer said customers really like The High Road’s clear jars, which make it easy to see the dense, good looking flower. The jars also include descriptions of the effects of that particular strain, something unique in the industry. Strains range from new hybrids to familiar favorites, including Durban Poison, Jack the Ripper, Pineapple Chunk, Blue Dream and Lemon Skunk. They also experiment with fun Star Wars-inspired names. “Hindu Kush is one of the oldest strains out there, and is also one that people still get excited about,” Brenette said. Overall, Grant is excited about all the advances in technology available to producers, and is looking forward to more great things in the next few years. He also enjoys meeting other producers, sometimes to compare notes or share strategies. Published: Sept. 7, 2018, 2:33 a.m.